Utility companies need Maryland Department of Transportation State Highway Administration (MDOT SHA) authorization before receiving MDOT SHA district office permits for work within MDOT SHA rights of way. As your utility's representative, you must verify that the utility is authorized to install, operate and maintain facilities in Maryland; that it is capable of maintaining and relocating your facilities as necessitated by MDOT SHA operations and projects; and that it can rapidly respond to an emergency. provide 24/7 contact information to MDOT SHA. The utility must comply with Title 12 – Underground Facilities of the Public Utilities Articles of the Annotated Code of Maryland if it has or will have any underground facilities. The utility must document that it is an “owner-member” of the “One-Call System,” as defined and required in Title 12. The utility must provide proof of insurance in accordance with Standard Specifications For Construction And Materials, Sections GP-7.14 Liability Insurance and TC-5.01 Insurance. Note: Make sure to list the Maryland Department of Transportation State Highway Administration as a certificate holder on the Certificate of Insurance. The utility must enter into a Utility Master Agreement with the MDOT SHA. Download a copy of MDOT SHA’s Utility Permit General Provisions (PDF, 2.58 MB) and the Utility Permit General Provisions Acknowledgement Form (PDF, 1.83 MB). 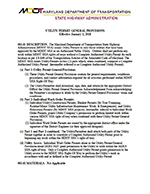 Utility Permit General Provisions (PDF, 275 KB) A) The Utility Permit General Provisions contains the general requirements, conditions, procedures and contact information required for all activities performed within MDOT SHA rights of way. 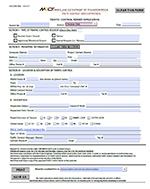 Because the Utility Permit General Provisions apply to all Utility Permits, you must download the Utility Permit General Provisions; attach a copy of the Provisions to each and every Individual Work Order Permit obtained from the appropriate district office; and post the Complete Authorized Utility Permits at your job sites at all times. 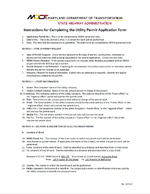 Utility Permit General Provisions Acknowledgement Form (PDF, 1.83 MB) You must sign, date and return the Utility Permit General Provisions Acknowledgement Form acknowledging your utility’s agreement to the Utility Permit General Provisions’ terms and conditions. 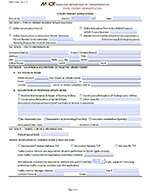 Utility Permit Application (PDF, 623 kb) MDOT SHA districts issue Utility Permits for specific types of utility work to be performed within MDOT SHA rights of way. These utility permits contain the special requirements, conditions, procedures and contact information for job-specific activities performed by your utility. They include work-specific attachments, plans and addenda (These utility permits are collectively referred to as 'Individual Work Order Permits'). Your utility must attach a copy of the Utility Permit General Provisions to each Individual Work Order Permit. Together, these constitute a Complete Authorized Utility Permit to allow the utility access to the requested MDOT SHA rights of way to perform specific activities. 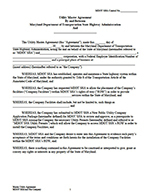 Traffic Control Permit Application (PDF, 1.1 MB) (formerly 'Lane Closure Permit Application') Traffic control permits are required for all work performed on MDOT SHA rights of way. You must return the completed Traffic Control Permit Application with the Utility Permit Application to the appropriate MDOT SHA district. 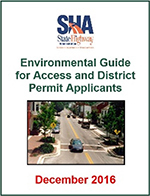 MDOT SHA Environmental Guide for Access & District Permit Applicants (PDF, 147 kb) explains key principles and provides required MDOT SHA landscape notes pertaining to plans developed for access and district permits.